A new symphonic angel has arrived on earth. 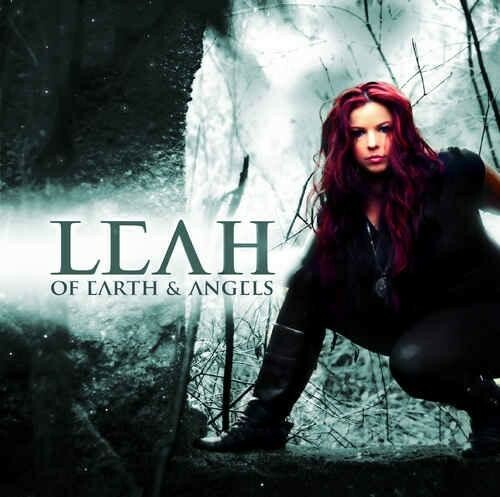 Leah is a Canadian singer with a style described as female fronted Celtic Metal. With that description, how could I be anything but intrigued by the prospect of her debut 'Of Earth And Angels'? The album opener 'Prisoner' erupts in bombastic fashion with a colossal riff, double drumming and lots of arrangements. The chorus is massive and catchy with an Arabian feel to the keys melody as Leah's wails penetrate deep into the soul. 'Old World' is exactly what it suggests: a Celtic-infused tune skips along intermittently as the guitar chunters throughout. There are some haunting vocals and acoustic guitar to start 'Tragedy And Magic', the song slowly un-wraps to build up to a gargantuan mid song twist where the six string explodes like a nuclear bomb. There's other up tempo numbers worth mentioning including 'Confess My Love' and 'Illusion'. The former has a soulful harp arrangement that flows into the soft verse before a riff grumbles up from the depths and leaps to the forefront for the chorus. 'Illusion' has a chiming guitar melody and striking strings that's eventually joined by a whopping riff all preceding another infectious chorus. The most atmospheric choice is 'Ex Cathedra' which is a powerful gothic track with a thick grinding progression and lots of held vocal notes. The album has a selection of highly charged ballads with the best being 'Remember'. The echoed vocals that start this gorgeous song reminded me of Enya and the guitar and violin harmony with Leah's sailing lyrics is an intoxicating mixture. Mid-song the guitars are unleashed and a truly humongous power ballad emerges. Vancouver has been harbouring an absolute gem of a songstress because this is utterly astonishing. I have no hesitation in saying this is a 2013 Top Ten album for me; possibly Top Five. With every track being a winner, I was bowled over from the first moment I first put it on and I never tire of it. If you want a comparison I would say this is Clannad/Enya meets Delain. Leah is a tremendous singer with the look of a real symphonic starlet; she has a beautiful voice and a great vocal range that is highly expressive and she just exudes passion and emotion. I personally feel Leah is equal to some of my favourite leading ladies including Sharon Den Adel and Elize Ryd. Musically the album is every bit as good as her vocal performance and the technical side is flawless. '...Earth...' is equal to any female fronted metal release this year and Leah is an act I urge anyone into that genre to investigate. This is a magnificent album that shows that a new symphonic angel has arrived on earth.